Data mining is the practice of automatically searching large data sets to discover patterns, to extract the information from data sets transform it into a simple structure which can be understandable. Data mining term is not just a single method or single technique but rather a spectrum of different approaches, which searches for patterns and relationships of data. Data mining is concerned with an important aspect related to both database techniques and AI/machine learning mechanisms, and which provides an excellent opportunity for exploring the interesting relationship between retrieval and inference/reasoning, a fundamental issue concerning the nature of data mining. Collect, extract, transform and load data into a data warehouse. Store and manage the data, multidimensional database i.e. either on in-house servers or the cloud. Provide data access to business analysts, management teams, and information technology professionals and determine how they want to organize it using application software. And finally, present the data in an easy to share formats, such as table or graph. Text mining is also known as Text data mining which is the process of deriving high-quality information from text. It is the set of processes required to get valuable structured information from unstructured text documents or resources. This requires both sophisticated linguistic and statistical techniques able to analyze unstructured text formats and techniques that combine each document with actionable metadata, which can be considered a sort of anchor in structuring this type of data. Once content has been annotated, it can automatically be classified, routed, summarized, visualized through link mapping and, most importantly, it becomes easier to search. Keyword-based technologies: The input is based on a selection of keywords in the text that are filtered as a series of character strings, not words nor “concepts”. Statistics technologies: Refers to systems based on machine learning. Statistics technologies leverage a training set of documents used as a model to manage and categorize text. All these approaches have a common feature, that they are all concerned with processing text in an approximate way whereas they are not capable to understand them. Data mining systems essentially analyze figures that may be described as homogeneous and universal. It extracts, transforms and load data into a data warehouse. Business analysts use data mining software applications to present analyzed data in easily understandable forms, such as table or graphs. Currencies, dates, names, might have to be managed, but they are easy to link to data and do not require any deep understanding of their context. Text mining tools have to face major technical challenges such as heterogeneous document formats (text documents, emails, social media posts, verbatim text, etc. ), as well as multilingual texts and abbreviations and slang typical of SMS language. Data mining is focused on data-dependent activities such as accounting, purchasing, supply chain, CRM, etc. The required data is easy to access and homogeneous. Once algorithms are defined, the solution can be quickly deployed. The complexity of the data processed make text mining projects longer to deploy. Text mining counts several intermediary linguistic stages of analysis before it can enrich content (language guessing, tokenization, segmentation, morpho-syntactic analysis, disambiguation, cross-references, etc). Next, relevant terms extraction and metadata association steps tackle structuring the unstructured content to nurture domain-specific applications. Moreover, projects may involve some heterogeneous languages, formats or domains. Finally, few companies have their own taxonomy. However, this is mandatory for starting a text mining project and it can take a few months to be developed. Data mining has been considered a proven, robust and industrial technology for many decades. Text mining was historically thought of as complex, domain-specific, language-specific, sensitive, experimental, etc. In other words, text mining was not understood well enough to have management support and therefore, was never valued as a ‘must-have’. However, with the advent of digitalization, the rise of social networks and increased connectivity, companies are now more concerned about their online reputation and are looking for ways to increase loyalty with customers in a world of increasing choice. As a result, sentiment analysis is the new focus of text mining. Companies have realized that information is a strategic asset made of text and that text mining is no longer a luxury, but a necessity! Concept Data mining is a spectrum of different approaches, which searches for patterns and relationships of data. Text mining is a process required to turn unstructured text document into valuable structured information. Retrieval of data With standard data mining techniques reveals business patterns in numerical data. With standard text mining methods discovers a lexical & syntactic feature in the text. Type of Data Discovery of knowledge from structured data, which are homogeneous and easy to access. Discovery of text from unstructured data which are heterogeneous, more diverse. 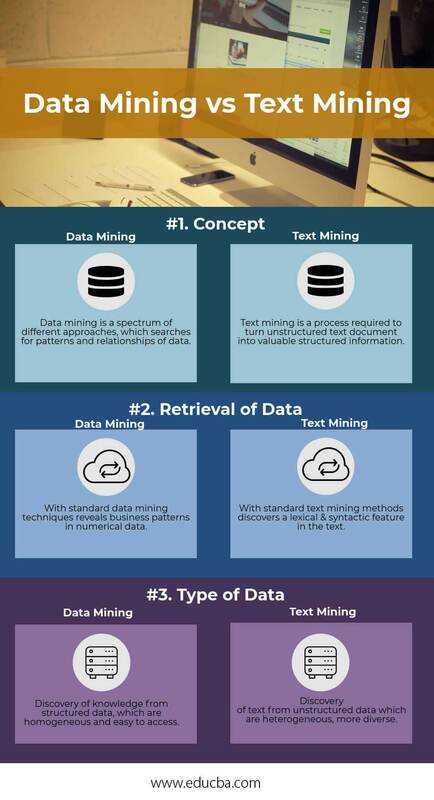 Text and data mining are now considered complementary techniques required for effective business management, text mining tools are becoming even more significant. A subset of text mining, Natural Language Processing is all the more relevant when the customer is 100% involved and available to help define accurate and complete domain-specific taxonomies. In turn, this helps information extraction and metadata association become easier and more efficient. Natural language will never be as easy to handle as figures, but text mining is now more mature and its association with data mining makes more sense. Don’t forget that 80% of information is made of text!